When was the last time you had a great tasting mountain pie (also know as pudgie pies, hobo pies & pie shams) cooked over the fire? We started making mountain pies early on in our camping careers and in the beginning things did not always turn out so well. Initially, we would just add pie filling to a couple of pieces of white bread and depending on my patients level would burn them or they would be under cooked. Either way the kids where usually disappointed in Dad's abilities as a pie iron chef. But through the collaboration with friends and years of trial an error we really have perfected the art of making great tasting mountain pies. And not just desert pies, we make sandwiches using jalapeno bagels or pretzel bread, pizza pies and so much more. So for any of you newbies to mountain pie making here are some helpful pointers to making the family or just yourself the perfect mountain pie. First, get the double cast iron pie iron from Rome Industries if you don't already have one. You can certainly use any of the different types of pie irons, but this Rome pie iron is big enough to do bagels and larger breads or 2 sandwiches at a time. And the cast iron metal holds in the heat and distributes it more evenly than the aluminum pie irons do. Remember new pie irons need to be seasoned which is a process of removing the wax coating used to keep the iron from rusting before initial use. And also gets it ready for years of cooking over the fire without rusting. Here is a great video on the process of seasoning your pie iron. We have found buttering the outside of each piece of bread or bagel will help crisp the bread much better than just using a non stick spray or oil. Be sure to pre-heat the iron, I actually like to get the iron pretty hot so that the pie will start cooking even with the iron off the fire. I do not bury it in hot coals but prefer to keep it above the the heat flipping and checking the pie often. Since the pie iron was hot to start with, all I am really doing is keeping it hot. The pie will burn fast if it gets to hot so better to take a bit more time cooking it then blasting it with high heat. Taking this time will also cook the inside of what ever your making, do it to fast and it will still be cold in the middle. I will also pull the iron from the fire a little before it is completely done, again allowing the heat to get to the center of the pie before the outside gets burnt. When your done be sure to spray the iron with some non stick spray or use a little vegetable oil which will help it from rusting in humid moist climates or if it will not be used for long periods of time. I am sure there are as many different techniques to making a great mountain pie as there are types of pies you can make. But this simple procedure has worked very well for us over the past 10 years and produced some great tasting mountain pies. 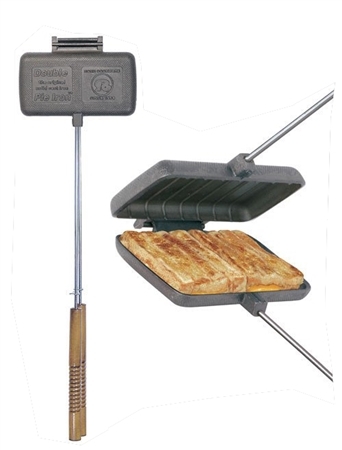 RVUpgrades.com is your first stop for Pie Irons as well as hot dog forks for great tasting cooked over an open fire food. Visit us today for everyday low prices on these and all of your RV Accessory needs! think he was holding on and after only one crash in to the bushes I was off riding on my own. 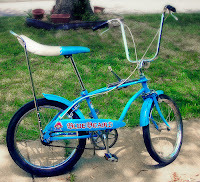 My second bike was a Huffy Blue Beard 3 Speed. I was in heaven when I got that thing and ever kid in the neighborhood wanted to ride it to. It had big white lettering on the sides of the tires, big handle bars, hand brakes, a 3 speed sifter on the top tube and a slick rear tire. It didn't take very long for me and the rest of the neighborhood to destroy it (maybe a year or so, which is a lifetime for a young kid) and I remember my father telling me I better find a way to fix it because he wasn't buying me another. It made it a few more years until I outgrew it and the rest of the kids where now riding 10 speeds. So one day my Dad surprised me and my brother with Honda 10 speed bikes. Who even knew Honda made a bike. These things where tanks, super heavy and not fun to ride. I remember when they broke we could not get any parts, so I am not sure if these where a short lived experiment by Honda or what. I remember letting a friend ride it (you would have thought i learned from the last bike) who had never road anything with hand brakes and he proceeded to crash it needed stitches for a major cut on his leg. I tried to ride the bike home after the ambulance took him away and while looking down at a wobbly wheel I crashed it into a parked car smashing the front forks in. Now not only having a bent wheel the front wheel could no longer turn because it was hitting the down tube portion of the frame. My father was not impressed and I remember not having a bike for a very long time after that. So what does all this have to with an E-Bike and what is an E-Bike anyway? Well, I love to bike and always have. My heart is in the dirt on a mountain bike winding my way through narrow single track. Unfortunately, that type of riding is not always available so I find myself riding streets, side walks and rails to trails quite often. I also take my bike with me when ever we are camping which is a great way to tour the area. But not knowing an area and the terrain, how do you know how far to ride before you should head back. And to be honest road riding is just not that fun for me, especially after getting a taste of the the dirt. So recently I did a little internet searching for maybe some kind of electric motor to help speed the ride up or if nothing else help get me back on a long exploratory ride of an unknown area. To my surprise they have really made some huge advancement in electric bike technology or E-Bikes. So the question becomes do you allow motors to enter into this human powered mode of transportation and a lot of purists are having a fit saying "No!". I'm not a purist, I ride to have fun and it didn't take long for me to say "heck yeah, I want one!" With RVupgrades.com located up by Lake Erie outside of Cleveland, I ride pretty much everyday during lunch and around these parts you ride into the wind on three quarters of the round trip. That is no fun, but if I had an electric motor to help push me along while I pedal, now your talking. So after a whole 3 days of deliberations and research I bought one and felt like I did way back when my dad got me my first bike, I couldn't wait! jumped on started pedaling and gave a twist of the throttle and Wow! was I impression with the power this thing has. It's not going to tote my 200 lb frame up a mountain without help, but with assistance you are humming along at 15+ mph in no time. I had so much fun on that first ride, the wind was blowing a good 10 or 15 mph and I was just tooling along no matter what direction I headed. Fast forward 6 weeks later and I am still loving this bike. I get more of a workout with this thing since I ride farther and tend to pedal much faster than before. This past weekend I took it with us on our RV trip to Lake Erie State Park in New York. I rode into Dunkirk as well as Brocton and to Luensman Overview Park which has a wicked steep hill on the way up. All places I probably would not have gone on my standard mountain bike, but glad I did and this bike made it a lot of fun getting there and back. 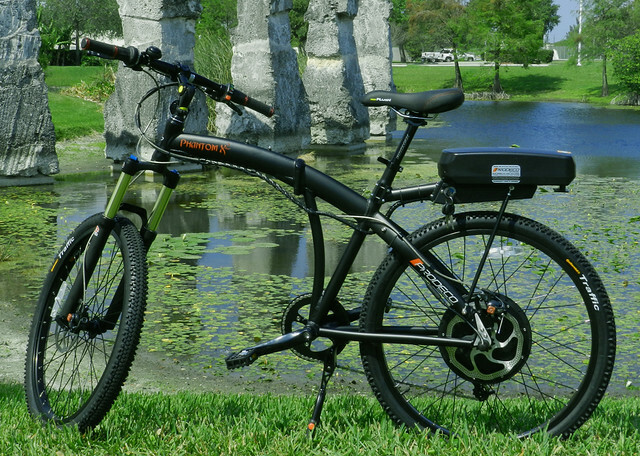 Where I see E-bikes being a huge benefit is for people who need short distance (under 20 miles) transportation, older riders that still want to stay active, medical patients recovering from knee, hip or back surgery. I've had 2 back surgeries myself and riding has kept me out of the operating room for over 10 years now. People who want to get back into shape and need some help getting there. And riders just looking to put the fun back into riding a bicycle.